As her sixteenth birthday approaches, Lena vows she will no longer watch from the sand: she will learn to surf even though her father forbids it. Because something keeps drawing Lena to the water...an ancient, powerful magic. And one morning Lena catches sight of this magic: a beautiful woman—with a silvery tail. Now nothing can stop Lena from seeking the mermaid, not even the dangerous waves at Magic Crescent Cove. And soon … what she sees in the mermaid’s mirror will change her life forever. I loved this book. It is a perfect beach or summer read. It is spellbinding---I was drawn in from the very beginning and could not stop until I finished the story in one sitting. I love it when that happens! 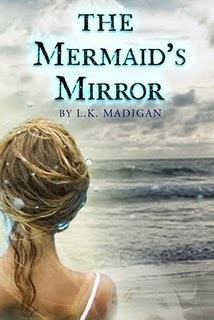 The Mermaid's Mirror is about a 15 year-old girl, Lena, who defies her parents and learns to surf. She is drawn to the ocean and sneaks around behind her parents' backs to surf in the most dangerous waters. Lena's mother died when she was four years old, although Lena does not know the circumstances surrounding her death. What follows Lena's surfing adventures are stunning revelations about everything Lena believed to be true. Lena's world is not what she thought it was, and she must choose her own path and determine her future in a series of heartbreaking decisions. I found the characters to be very relatable and well developed. Oftentimes, I find that characters with smaller roles are flat and not very "fleshed-out." L.K. Madigan does a great job of developing each character in the story. Her writing is enchanting. I found myself compulsively reading "just one more page," until I finished the entire book! The book moves at a good pace, with an ending that will leave you wanting more. All the focus on beaches and surfing made me want to visit the beach so badly I could barely stand it. I don't want to give anything away, so I'll just say I loved Lena's world. hrmm.. It said you were part of the blog hop. I am but I haven't posted about it yet. I wasn't really convinced with this book but I agree with what you said about "smaller" characters are sometimes left out so I liked that about this book. Thank you Sharli! I really did enjoy this one a lot. It was very well-written. I would definitely recommend it! I am glad to hear this one is a good one. I have been wondering about it. It is good, I really enjoyed it!